Central Minnesota is home to vast rolling prairies and lush forests, the perfect market for a guy like Dean Virnig, who along with his wife Lois launched Virnig Manufacturing, Inc., in 1989. Although Virnig Mfg. began as a weld shop working out of a garage on the family’s 5-acre lot in Pierz, MN, Dean quickly filled a lucrative niche when he developed a line of skid-steer loader attachments and dump trailers. Word spread quickly throughout the region, and the company has grown by leaps and bounds. What began in a little garage with a few welding machines has blossomed. As Virnig Manufacturing approaches its 25th anniversary, it now resides in 40,000 sq. ft. of manufacturing space spread over two buildings in Rice, MN, and boasts 46 employees. Virnig added this Bystronic Bystar 4020 laser-cutting machine, equipped with load-unload automation, in mid-2012 as a replacement for its 2004-vintage high-definition plasma-arc-cutting machine. Included is an under-machine-mounted shuffle-drive conveyor that moves parts, scrap and slag to the elevating conveyor shown here, which deposits everything into a bin. 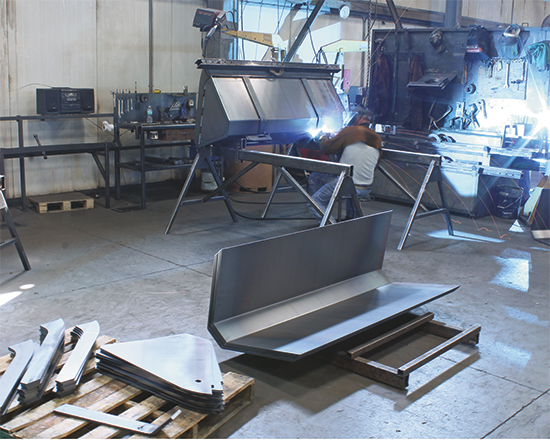 Virnig fabricates skid loader attachments primarily from Grade 50 mild steel 3⁄16 to ½ in. thick. Some 110,000 lb. 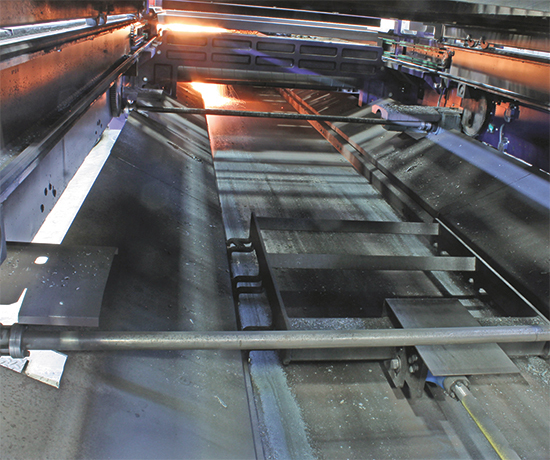 of steel pass through the shop per week, says Dean, and 70 percent of that runs through his workhorse cutting machine—a Bystronic Bystar 4020 (6000-W CO2 laser, with sheet capacity to 2000 by 4000 mm). Virnig added the cutting machine, equipped with load-unload automation, in mid-2012 as a replacement for its 2004-vintage high-definition plasma-arc-cutting machine. A peak underneath the Bystar cutting table reveals the shuffle-drive conveyor. It completely covers the underside of the cutting machine, and frees the operator from having to remove parts from the trays that come standard with the machine. A year later Virnig made the leap, investing $1 million in his automated Bystar setup. “The benefit of cleaner cut parts, improved accuracy, less—or no—post-cut edge cleanup, improved fitup and a cleaner shop—no fumes, like you get with plasma—has made the investment easy to justify,” Virnig says. Virnig combined the best of both worlds by customizing the Bystar and adding a shaker conveyor underneath, digging out a pit to make room. The conveyor captures all of the parts, scrap and slag that fall through the table, he says. It moves everything to an elevating conveyor that carries the material up and out of the pit and deposits it into a bin. The operator periodically goes to the bin to pull out the parts, while the machine’s automation setup picks up the remaining skeletons from the cutting table and any remaining parts. The conveyor also helps support lights-out cutting on the Bystar. Each nested sheet typically takes about an hour to cut, so after 4 hr. of lights-out cutting there will typically be four sheet skeletons stacked on the unload table for the operator to deal with. And, four sheets’ worth of parts in the bin have to be sorted. Parts then route to several manual weld booths in a 30,000-sq.-ft. production building adjacent to the fab shop. Even running lights out, Virnig finds the shop maxed out in terms of processing steel. Rather than turn again to outsourcing, he installed, just this past August, a second laser-cutting machine. This time he “upped the ante,” he says, and went with Bystronic’s state-of the-art BySprint Pro 3015 (also with a 6000-W CO2 resonator, and with a maximum sheet size of 1500 by 3000 mm). The BySprint Pro features upgraded piercing and cutting technology, and significantly greater acceleration pierce-to-pierce, which Virnig believes will really pay off when processing its more hole-intensive sheet nests. Maximum acceleration is 12 m/sec.2 (compared to 3 m/sec.2 with the Bystar 4020), and maximum velocity is 140 m/min. (85 m/min. with the Bystar). “We’ll leave the nests with fewer pierces and that require fewer non-cutting moves to the Bystar,” Virnig says. See also: Bystronic Inc., Mayfran International, Inc.